We check out a brand that claims their products are just as good for the environment as they are for the gents that use them. 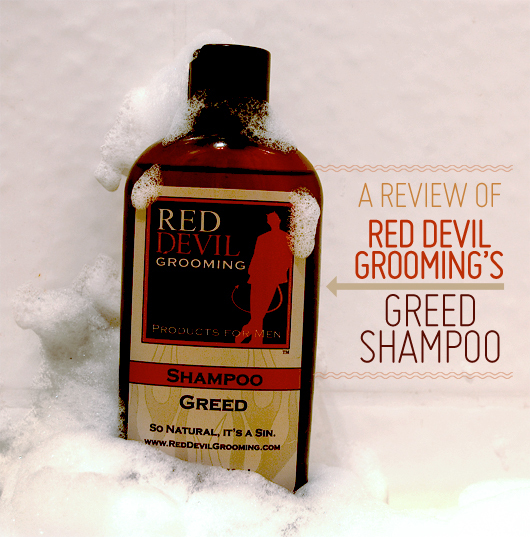 No harsh chemicals, and paraben free, we put Red Devil Grooming's Greed Shampoo to the test. Boasting 78% organic, the Red Devil Grooming “Greed” shampoo has flown to the top of my favorites list. And it is not because I was given this product to test. I am probably the guy you meet at a party who doesn’t care about the product he uses in his hair. I was always one of those shoppers who would use whatever I could find. It could be whatever feminine product my mother most recently fell in love with, or sent me in the mail. Or perhaps the little bottles from my last hotel trip. But this product, I genuinely like. My hair is currently very short, so it is very easy to get a lather going with about a nickel sized portion and it is lathery enough so it doesn’t run down my face while I let the shampoo do it’s thing for a few minutes. The Red Devil Grooming website says this product is sulfate free, paraben free, with no animal testing or by-products, and the best part, no synthetic fragrances. But that is also the ironic part to me. This product has left me excited about shampooing and how it makes my hair and scalp feel. Without any other words, I leave feeling refreshed and that’s the perfect result. Maybe I am a bit greedy. You should be too. Check it out. $8.95 on Red Devil Grooming's website. Richard, you sound like a woman, knock it off. All those things don’t matter. And if they’re not testing on animals that means they are testing on their customers – which is HIGHLY UNETHICAL!!. For that reason alone people should avoid it. Show these companies that you don’t want them testing on you. Chris, That’s not very gentlemanly of you. Don’t like it? Don’t buy it. Leave the trash talk for the kiddies. Andrew, I call them as I see them. I feel sorry that a grown man finds my approach to be ungentlemanly. Good luck to you. Hmm. I guess this would be a great gift for my man to have on his birthday. I think the smell of this one is manly too. I might try to see this for myself. looks like they didnt pay their hosting bill..